I am not into this theme at all but when I saw the dwarf I had to have him. Then I noticed that a klicky in a cannon set looked a lot like an elf - so I got him. Elf and dwarf. Then Gandalf showed up in the Figures series. Done. The three of them together were clearly missing a fighter type, so I looked through the sets until I found a tough looking guy. Nice group! I actually really like the green dragon knights. It's sort of cool that figures are still being released that fit with their order. The edge of that theme is interesting. What I mean is, out on the fringes it starts to become a general fantasy/Tolkien/D&D theme, as in the figures shown here: wizard, elf, dwarf, fighter. Classic fantasty types. Yet they're all still wearing the green dragon army livery. So there's a tension there. Well, the one on the left could be a scout for the green dragon army and the one next to him a squire for a knight (he lloks young enough for this). 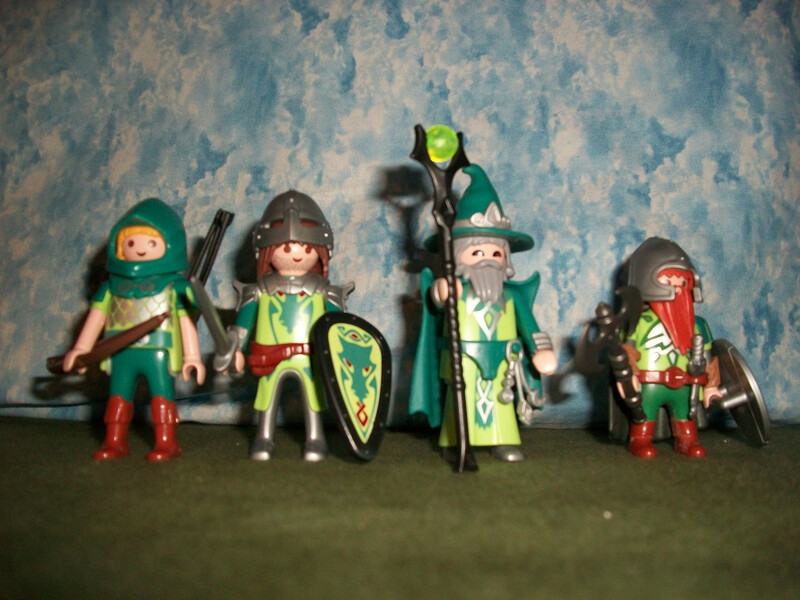 The next one could be the official green dragon army wizard, like Merlin and King Arthur, and the dwarf on the right could be just that, a dwarf to amuse the king and his top men, as used to be the case in mediaeval times. Exactly, it could go either way, though recall that medieval armies did not have uniform, er, uniforms the way modern armies do. So it's a bit strange. though recall that medieval armies did not have uniform, er, uniforms the way modern armies do. You are quite right. The king or lord would call upon his retainers to provide a given number of fighting men. In mediaeval times, the word "lance" didn't just refer to a weapon, it also was a military unit consisting of a knight and his squire and a number of men-at-arms, a lance in total being about half-a-dozen men. The men-at-arms might have padded jackets for protection and a padded cap or simple metal helmet and some sort of insignia, a badge maybe, which showed which knight they followed. As a result, a mediaeval army would be a mix of colours and coats-of-arms.